Sometimes the simplest of designs can make you achieve the once considered impossible. 'Curtis Boirum', a Master student in Mechanical Engg. at Bradley University, Peoria, Illinois just proved the fact. He developed a Hemispherical omnidirectional gimbaled wheel (HOG) drive system which basically is nothing hi-tech so to speak, but its pure genius. As you can see in the picture the design is really simple. It has a black rubber hemisphere that's mounted on the shaft of a high speed brushless motor salvaged from a RC plane. 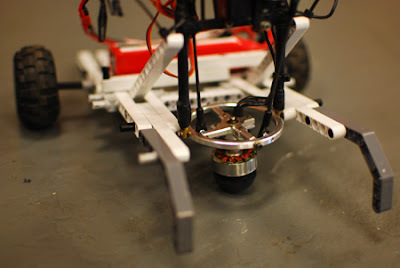 The motor is attached to a 2 axis gimbal, the assembly is attached to the frame which has a RC servo to control the tilt of the hemispherical ball. It basically rotates like a spinning top with servos to help it move left, right, forwards and backwards. So how this thing works is that, when the hemisphere is vertical, it's just like a spinning top and basically acts like a castor wheel, but when you tilt the hemisphere one of side of the ball which is already rotating at high speed, makes contact with the ground, this gives it a torque in any direction near-instantaneously, depending on which side of the hemisphere is touching the ground and what direction the spinning ball is rotating in. To simply put it together the robot can change its direction very instantly. For example, if the hemisphere is spinning anti-clockwise and its tilted to the right side, it will 'push' the robot in the direction of the two wheels that are attached. Another interesting thing is that the amount of torque is proportional to the tilt of the hemisphere. You can almost get an infinite range of speeds and torques so to speak. Curtis also developed a version with two of these gimbal units, which makes the vehicle completely omni-directional, almost appears like its hovering on the surface if you see in the video. He says the idea is not new but something that was already tried out 100 years ago, but seemed to be almost forgotten. He demoed this at RoboGames 2011. He has also submitted a paper to the RoboGames symposium. He is hoping to create a cheap, powerful, omnidirectional drive system design that can be adapted for use by both researchers and hobbyists. 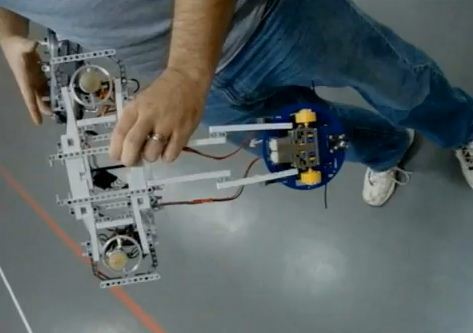 Check out some really cool maneuvers of the robot.